How Does a Ductless Air Conditioning System Operate and is it Useful? HVAC systems are an indispensable part of every household. These make up a great part of a home owner’s initial costs and monthly maintenance as well. Hence it is important to find a system that is most suited to your home and one that is affordable and energy efficient. A ductless air conditioning system refers to a system that consists of a wall-mounted indoor unit which corresponds to an external compressor unit. This is a good option for places where window ACs cannot be installed. Unlike window ACs, a ductless air conditioning system only requires a small hole in the wall for the pipework. This reduces the chances of leakage and is thus safer. How does a ductless air conditioning system work? The external condenser of the ductless AC pumps and cools refrigerant through copper wires which then lead to an indoor unit. The cooled air that reaches the indoor unit is then distributed into the room through an in-built fan. 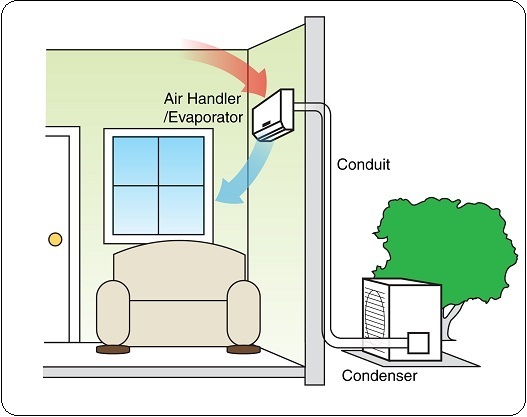 A ductless air conditioning system may have one indoor unit corresponding to one external compressor or one external unit corresponding to multiple indoor ACs. The first type is known as a split ductless air conditioner system and it cools just one room of your home. The latter is called a multi-split air conditioner system and can cool up to five indoor rooms using just one outdoor unit. These are space saving and do not occupy any windows. You have greater flexibility to manage the temperature settings of each room with ductless air conditioning units as each unit of a ductless AC system has its individual thermostat. This in turn will make your home more energy efficient and reduce wastage of resources (in certain areas of the house) that may occur with central HVAC systems. In traditional central air conditioning systems, air has to pass through a duct in your walls or the attic for being cooled. This causes loss of air and thermal energy that can increase your electricity bills. Ductless air conditioning systems are more energy efficient. As there are no ducts, installation costs are not very high. Plus it does not cause much damage to the walls of your house. Ductless AC units are available in a variety of colors and designs that complement your home décor. The external compressor and the inside air unit can function well even at a distance of up to 50 feet from one another, allowing you to install the units as per your convenience. Generally, the number of ductless air conditioning units you need depends on the size of your house, its energy efficiency, its layout, the climate of your region, your overall usage, and your budget. One AC unit per room is often quite adequate for an average sized room. But if you live in extremely hot climate, one external unit may not be able to take the load of cooling your room to the temperature you desire.